May: Art sale at Lymington Halls, Hants. July. Featured in Emerging Potters online magazine. Thanks to the editor Paul Bailey for featuring my work. August 2016. Exhibition at Romsey Abbey, Romsey, Hants. (Organised by Rum's Eg Gallery) Entitled 'Dissolution and Revolution', part of Hampshire's 'Royal Blood' theme for 2016. Nov 5th 2016: Art and Craft sale in Marlborough, Wiltshire. Thanks again to the organizers and to everyone who bought a piece! Upcoming Exhibition at Sculpt Gallery, Great Braxted, Essex. Thanks to curator Debra Blik for organizing a brilliant exhibition! A good clutch of pots found new homes. Note the diffuse light which is most suitable for bringing out the best in reduction lusterware. 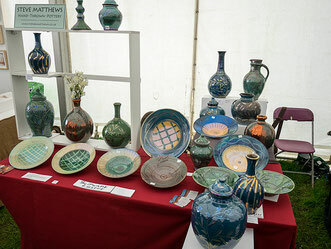 A great weekend at Hatfield ArtInClay. Many thanks to Andy McGuiness and Valentine Clays for organising this event. -Rum's Eg Gallery Closure- Unfortunately, this brilliant gallery in Romsey has had to close. I can only thank the owners and staff for all they have done to promote my work this past few years. Antique and Craft Fair at Shenley Park, Hertfordshire.